93% of Crimean voters choose Russian annexation, US doesn't recognize 'rigged' vote given Russian occupation. Ukraine's Crimean Peninsula held a referendum vote on Sunday, in which 93% of residents reportedly voted to become annexed by Russia. The vote affirmed an earlier Crimean parliamentary vote. Two options were presented in the referendum, the first being annexation of the peninsula by the Russian federation, and the second a return to the nearly autonomous position that was held in 1992, with the possibility of a later Russian annexation. 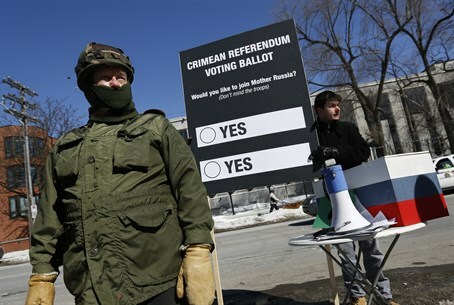 There are questions of coercion in the vote, as Russia effectively militarily occupied Crimea on March 1, with troops taking over the Belbek Airbase. Russia has been consolidating its military hold over the peninsula since, ignoring American condemnation. US Secretary of State John Kerry spoke with his Russian counterpart Sergei Lavrov on Sunday, warning him that the referendum was not held according to the law, and that America will not recognize the results. The White House announced in a statement that the referendum was "administered under threats of violence and intimidation from a Russian military intervention that violates international law," reports CNN. "The days are gone when the world didn't confront the attempts of one country to take over another," added the White House statement. Heads of the European Union similarly added their "strong condemnation," calling the referendum "not legitimate" and illegal. They further called on Russia to withdraw its troops from the area. Ukraine's Defense Minister Igor Tenyukh announced Sunday that Ukraine and Russia had agreed to a temporary ceasefire in Crimea until Friday. In the agreement, Russia promised not to act against the Ukrainian army and its bases in the region until the weekend, in order to allow Ukrainian troops to resupply. Ethnic Russians reportedly make up 58.5% of Crimea's population. The region was given to Ukraine, then part of the Soviet Union, by Soviet leader Nikita Khrushchev back in 1954. The rising anti-Semitism that has accompanied the chaos of Ukraine's revolution has been felt in Crimea as well, where a local synagogue was vandalized two weeks ago.